I know, I haven't blogged for a while. It's not that I'm a bad blogger—it's that I'm a good Savta! Our three grand-children have been visiting here for two weeks and it's hard to get to the computer when you're playing the Funny Face board game five times in a row with a two year old! So, after many hits and misses, I finally finished the "art wall" over our living room sofa. Below is the "before"...the taupe colored walls were crying out for some art and color. My first plan was to paint two canvases in the style of Mark Rothko but after working for hours I hung them on the wall and they were just. so. wrong. So it was Plan B—using a group of art I already owned mixed with some new pieces I created. The first step was cutting Kraft paper to the sizes of the framed art and taping onto the wall. I worked slowly replacing each piece of paper with the art making sure I liked the way it was working. The new art makes such a difference and really finished off the room! You can see how I made the ring mirror here, and the "finger painting" artwork here. The top left print is from Minted, (a great place to find affordable art) and others are originals from art school friends. Gotta run...time to play the Funny Face game with Zelda. I like your Rothko paintings. I hope you get a chance to use them somewhere. 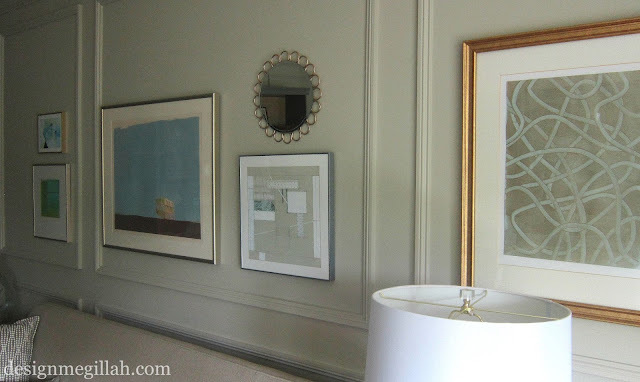 It's the french molding on the walls that makes them hard to work with, but you've definitely made the best of it.